This set is so pretty and this is the first time I have used it. I have seen so many beautiful cards with it that I think I scared myself off to make a card with it. 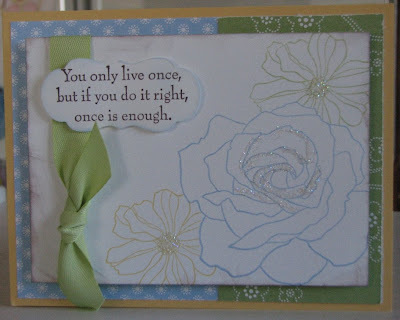 I like how this card turned out although my photography has been horrible lately. My base is So Saffron and I used last years Sale-A-Bration designer paper next. I stamped my flowers with Certainly Celery, So Saffron and Brocade Blue ink, on Whisper White cardstock, using the masking technique. I added glitter, distressed the edges with Chocolate ink and tied a bit of last years Celery Sale-A-Bration ribbon around the card. Of course I needed a little saying on the card, so I stamped my 'sentiment' in Chocolate Chip ink on Whisper White cardstock and used my Lots of Tags Sizzlit die to cut it out.